Residential Electrician Marin County: Advice From A Master Electrician: Will Certain Lighting Cause Retina Stress? Among many circles, it is accepted that artificial night-time lighting appliances can cause various adverse health side-effects in both humans and animals. In fact, there have been studies that prove that exposure to optical radiation can have effects on human physiology and behavior. But there is a need for much more research to be conducted before we go jumping to conclusions about the effects that certain kinds of lighting can have on you. Although nothing has been proven, it does make for an interesting discussion topic. The main point of worry for most researchers? LED lighting. This French agency, however, feels much differently about the adverse effects lighting after dark can have on human beings. They recently published a report that stoutly states that lighting that uses light-emitting diodes almost certainly has health risks associated with it, mainly LEDs. However, these side-effects of LED lighting systems mostly trouble the eyes more than anything else. The agency’s concern is centered around blue light and the risk of glares causing “toxic stress” to the retina. The article they released mentions that blue light is most dangerous to those who have had low exposure to it, steadily, over a long period of time. They go on to mention that the damaging component would be the result of cellular oxidative stress, it goes on to mention that children, workers that are exposed to the lighting regularly and light sensitive populations are the individuals that are at the highest level of risk. The agency concludes the report stating that the photobiological safety standard is ill-adapted to LEDs and using the Unified Flaring Rate that’s used on the other types of lighting is not an acceptable form of measurement for LEDs. This does not mean that you need to be overly concerned about the LEDs in your home. The main worry across these educated organizations is from the glare, which is rarely an issue in residential electric systems. 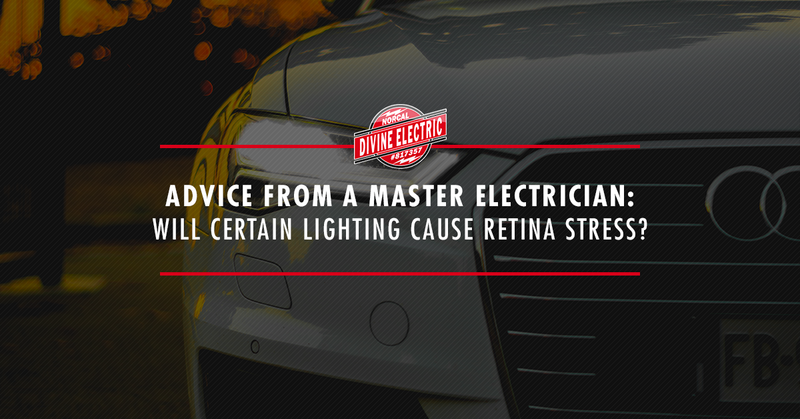 If you have a question about how to adjust your lighting system to avoid glare and potentially become greener without using LED lighting, Divine Electric Norcal is here to help. With our wide range of services and expansive expertise, we can certainly find an alternative that will suit your needs. Contact us to discuss electrical services, including emergency electrical services if you need them. We’ve proudly served Marin County for many years and intend to continue for many more.